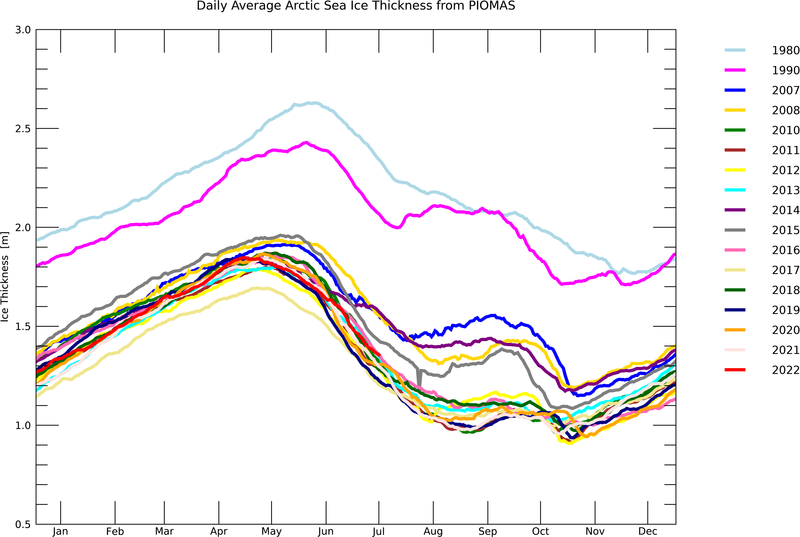 "What is making the Arctic ice melt faster than expected" is the question asked by the Scripps Institution of Oceanography in an article complete with a picture of polar bears on an ice floe. This is a particularly stupid question as anyone with a double digit IQ would research and know that the Arctic ice is currently staging a spectacular recovery and is at the highest extent in a decade. Obviously this would rule out climate "scientists". 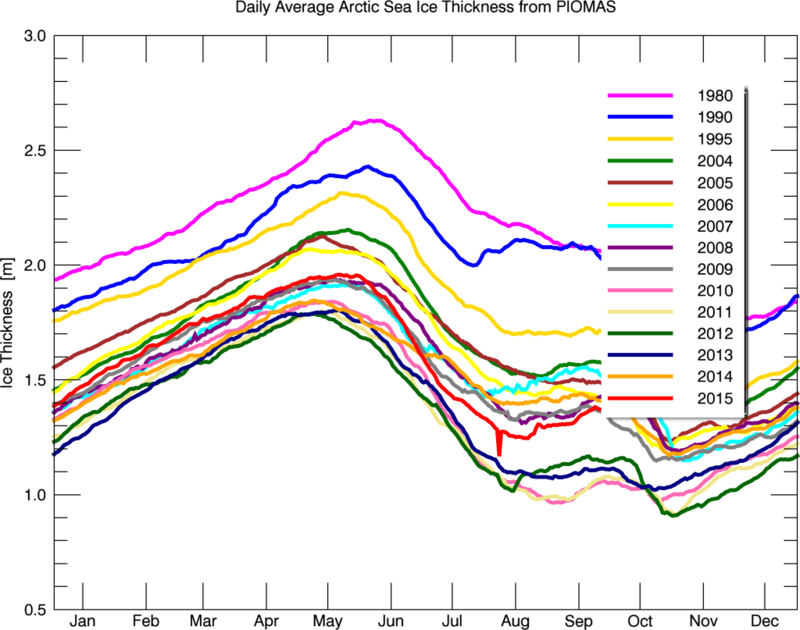 Arctic ice thickness is up 40% in the past 4 years! Coldest Winter in 50 Years? Trust the bookies , not climate "scientists"
The UK and much of Europe is battening down for what is predicted to be the coldest winter in 50 years buried in what climate "scientists" call " a thing of the past".As we will have the largest global meeting of climate dimwits in Paris in the middle of this winter it will be interesting to hear how they blame the freeze on global warming. Bookies however who are risking their own money are banking on a white Christmas showing how much smarter they are than climate "scientists" who have their snouts into the Government trough. Bookies have slashed the odds on a white Christmas after experts said that Britain could about to be hit by double winter whammy. Yesterday warnings of a big freeze from the West led the bookies to cut the odds of snow on Christmas day from 5/1 to 2/1. It comes a week after the early arrival of Berwick swans led nature experts to forecast an icy blast from the East causing the coldest winter for fifty years. Scientists say temperatures in 1,500-mile wide stretch of the Atlantic Ocean reached an 80 year low between January to August this year, meahing colder than usual westerly winds. They say the melting of the Greenland ice cap could have have slowed the Gulf Stream, which pushes warm currents towards Britain. 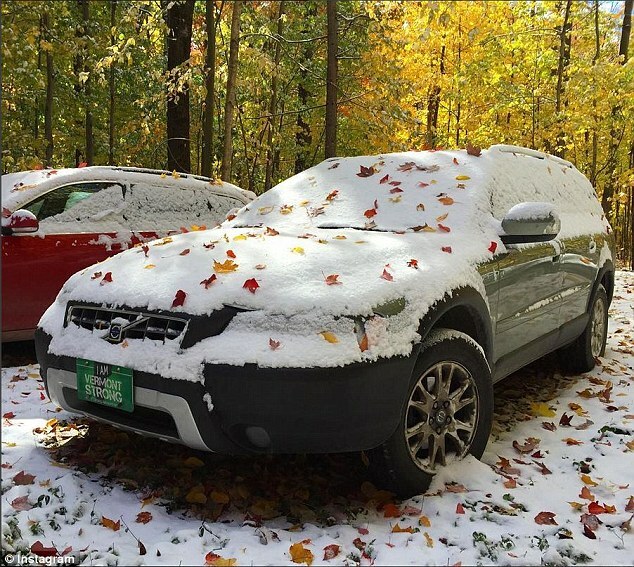 AccuWeather meteorologist Tyler Roys said: 'We'll see full-on cold spells.Northern England faces colder-than-normal periods, some of which could affect southern England, and Scotland is forecast a colder than normal winter." He says minimum temperatures of -8C to -21C are possible. The news comes a week after nature experts predicted that Britain is facing its longest winter in 50 years because of the earliest-ever arrival of a Siberian swan bringing heralding an unusual cold front from the East. Normally the swawns migrate 2,500 miles from Arctic Russia to the Wildfowl and Wetlands Trust reserve at Slimbridge to escape the cold front. PS: It seems the Orwellian warmist crew have been at it again and Viner's statement that "snow will be a thing of the past" has been erased . However thanks to the internet ,here it is from an article in the Independent in 2000. 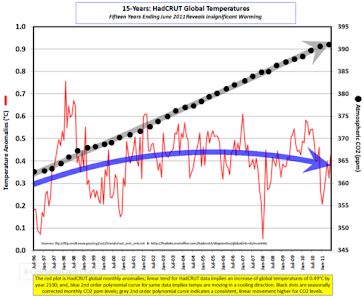 The Sydney Morning Herald headlines that September global temperatures have set a new record high which feeds into the alarmist propaganda buildup for the Paris climate meeting in December. However as usual the truth is somewhat different. The accurate RSS satellite temperature record shows that September was the 4th highest for the satellite data which is not unexpected with the strong El Nino effect. 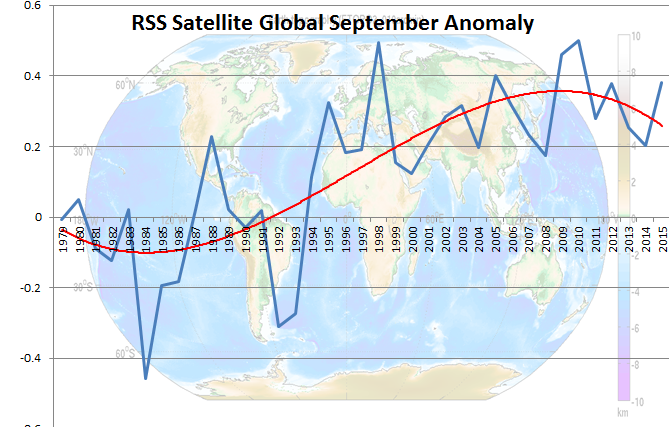 Meanwhile the pause continues with the globe actually cooling over the last decade contrary to claims by alarmists. Bewick swans migrate 2500 miles at the start of winter from Siberia to the UK and this weeks arrival is the earliest in 50 years. This migration is a week earlier than 2010 which saw a horrific winter in the UK and if the swans are right 2015 could be a repeat. 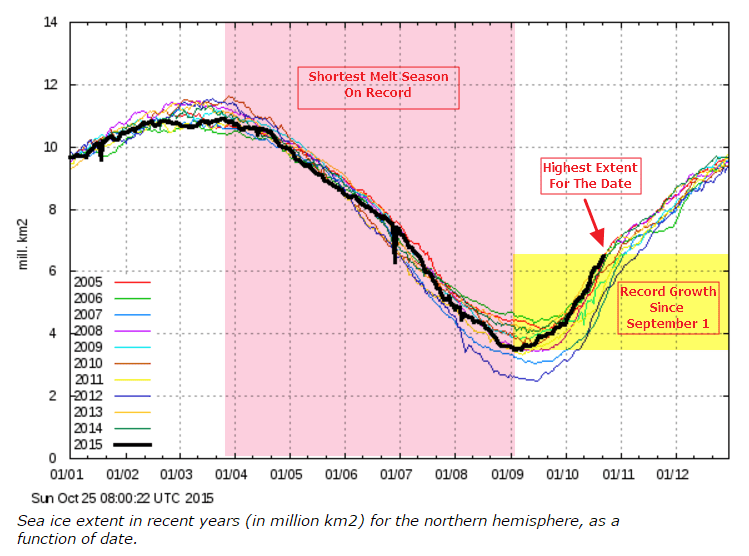 Meanwhile mindless flocks of climate "scientists" will be migrating to Paris this winter because of imagined warming . It is no contest which is the smarter. Each year around 300 Bewick's swans migrate 2,500 miles from Arctic Russia to escape the approaching cold weather which follows closely behind them. The first bird arrived on Sunday - a full 25 days earlier than last year and the earliest date on record. The premature arrival of winter in many European countries has encouraged Bewick's swans to flock westwards earlier than usual. Temperatures are currently five to 10 degrees below average in parts of western Russia and eastern Europe and are expected to drop to the minus 30s. Spurred on by bitter north easterly winds, many of the swans are currently gathering in the Netherlands, with 45 on Lake Gooimeer and 80 on Lake Lauwersmeer. 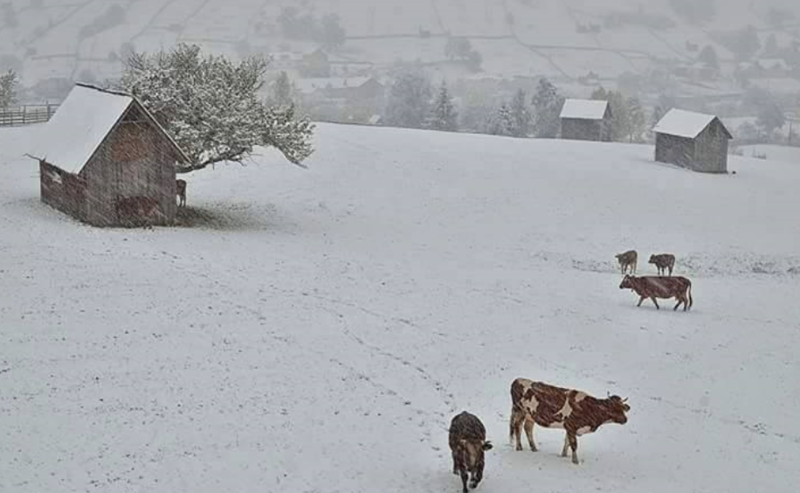 Early Frost and snow in Europe in the "warmest year ever "
Early frost and snow in Europe may bring shivers to organisers of the Paris Climate Scamfest if December brings a repeat of previous extreme European winters. This is in stark contradiction to the earlier projections of snow would be a thing of the past. WetterOnline here also reports of snow in Romania with photos. Again this only reinforces the trend that Europe has been cooling over the past 2 decades. "Scientists" have been monitoring the effects of global warming on spring leaf growth in Germany and were surprised by the results. They would be better off using science rather than Lysenkoism as a basis for their research. The above temperature graph shows February temperatures in Germany which are getting cooler! Visually impaired Frederick could see that you can not measure effects of warming in a cooling trend. No Tricks Zone has the story translated from the German. So why is leaf unfolding not happening as early as expected? The authors here appear to be baffled and thus are left speculating and offering adventurous explanations. Maybe they ought just take a look at the temperature trends for spring and winter in Europe. If they did so, they would find that winters and early springtime have gotten COLDER over the past couple of decades, and not warmer as the authors seem to believe. Back in early April I posted on this here. Winters have not been warming and spring has been in fact delayed. Spring flowers have also been found to be blossoming later. Austrian and German winters have also gotten COLDER over the past 25 years . Moreover the European Alps have gotten “considerably colder” over the last 26 years. 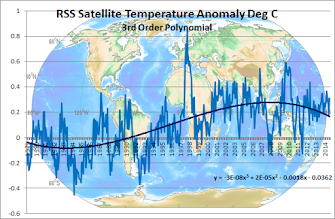 It’s truly stunning that the authors seemingly never bothered to look at the temperature trends.